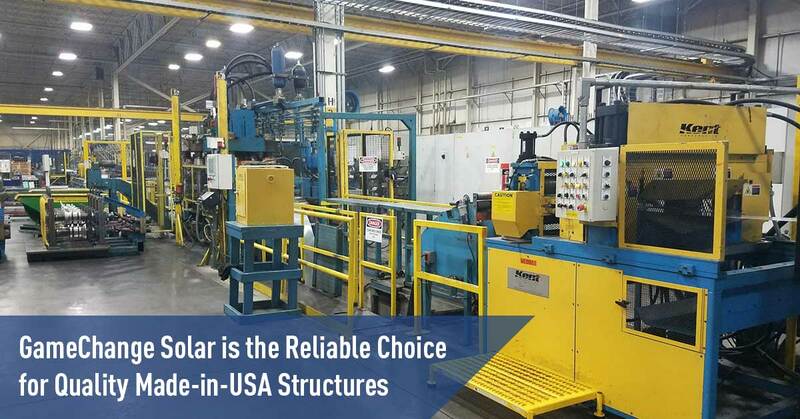 NEW YORK, NEW YORK – March 11, 2019 – GameChange Solar today announced that with the company’s made-in-the-USA structures for both fixed tilt racking and trackers allow the company to deliver the highest quality and most reliable products in the industry. GameChange fabricates all of its roll formed components and I beams in the United States, mostly in the Midwest and Southeast. With over 80 manufacturing lines at over 10 locations, GameChange has a diverse and broad supply chain capable of manufacturing over 9GW annually of solar racking and tracker structures in the United States currently. There are also plans in place to significantly increase capacity in 2020 and again in 2021. With delivery timelines of 4 weeks for DG utility and C&I orders for roll formed systems and 5-7 weeks for I beam systems, GameChange Solar is able to meet the tight delivery timelines required by customers. In addition, with the ability to deliver small jobs averaging 5MW - 20 MW as well as larger jobs typically of 100MW – 700MW, GameChange Solar has the versatility to meet customer’s varied requirements in a timely and quality manner. Larger jobs usually require deliveries to be conducted over longer time periods due to construction scheduling requirements. GameChange Solar is able to meet the complex staged delivery schedules required in these situations where there are generally few or no long term laydown areas and the laydown areas are built over as the job continues. GameChange Solar is a leading manufacturer of fixed tilt and tracker solar racking systems, with over 4 GW Sold. GameChange systems combine fast install, bankable quality and unbeatable value through superior engineering, innovative design and high volume manufacturing.